The smart home What Is A Smart Home? What Is A Smart Home? We recently launched a Smart Home category at MakeUseOf, but what is a smart home? Read More is supposed to make things easier, providing time-saving automation and reducing the scope for things to go wrong as a result of user error. Sadly, it doesn’t always work out like that – in practice, something as simple as automating a lamp can cause unforeseen headaches that’ll leave you wishing for the return of good old candles. 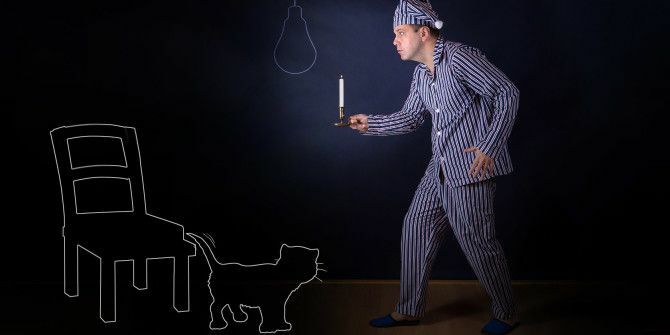 Here are some of the more unexpected ways in which a smart lamp could cause you problems, potentially even putting you in more serious danger. We’ve also included a few useful ways to work around those issues. Setting up smart lighting is often one of the first steps taken by people who want to create a smart home. In the world of home automation, creating a system which simply allows you to turn lights on and off from your phone or tablet is at the cheaper and simpler end of the scale 6 Types of Home Automation You Can Actually Afford 6 Types of Home Automation You Can Actually Afford Are you ready to join the smart home revolution but worried that it's beyond your budget? Smart homes aren't that expensive, and there are plenty of components that the average homeowner can afford. Read More . There are lots of reasons why you might want to set up such a system – perhaps the ability to turn on a light in your hallway when you pull into your driveway when you get home from work, or a way to turn on a soft bathroom light from your bed when you need to stumble to the bathroom in the middle of the night. Done properly, these setups clearly have a many benefits. Done badly, there are all sorts of pitfalls. A light that turns off when you least expect it can cause many issues – both financial and health-related. For example, accidentally kicking the cat in a darkened hallway could set you back $100 in vet fees, falling down the stairs as you come out of the bathroom in the middle of the night could send you to the ER, while being plunged into darkness whilst actually using the toilet could lead to untold embarrassments that we won’t delve into here. If you just want to turn lights on and off from your phone, you don’t need to look any further than Wink (available on Amazon). Wink can connect your whole home Wink Connects and Simplifies Your Smart Home Wink Connects and Simplifies Your Smart Home The smart home market is currently full of innovative products, but they don't always work together. Wink sets out to connect them all together in a truly smart way. Read More – but one of its strongest areas is lighting (though be warned, it does lack some advanced features). It’ll work with several leading smart home brands (such as Quirky, Nest and Philips) and it’ll let you control them all from one single app. If you want to get a bit smarter, you could try out the Occupancy Sensor Switch by Lutron. Once you’ve installed the sensor, it will automatically detect whether or not someone is in the room and turn the lights on accordingly. It’ll even turn the lights off again when you leave the room or if someone accidentally leaves the light on, and it won’t turn the lights on in daylight if it judges the room to be light enough already. With energy prices increasing relentlessly, electricity bills can shock us 5 Smart Hacks To Save Electricity In Your Smart Home 5 Smart Hacks To Save Electricity In Your Smart Home he trick to saving electricity is in knowing where most of your energy is consumed. Read More at the best of times (pun intended). Keeping your toaster plugged in at all times can add $15-$20 to your monthly electric bill. Thankfully, with a carefully planned household budget Watch Your Spending & Control Your Budget With These 8 Free Budget Calculators Watch Your Spending & Control Your Budget With These 8 Free Budget Calculators Any personal finance adviser will tell you that developing and maintaining a financial budget is the best way to meet monthly expenses, save for financial emergencies and plan for the future. A budget calculator allows... Read More these steady increases can be taken into consideration. What can be more problematic is if you get a one-off high bill that you were not expecting – yet that’s exactly what could end up happening if you incorrectly set timers on your smart lights. Let’s say, for example, that you are luckily enough to have a small vacation apartment somewhere in the Caribbean. When you lock it up for the year you want to set a light to turn on in your hallway, lounge, kitchen, and above the front door between 7pm and 11pm every night (4 hours), but instead, you accidentally set the lights to come on between 11pm and 7pm (20 hours). This would have profound consequences on your bill. A 60 watt light bulb costs approximately 0.875 cents to run per hour. That means that four lights running for 20 hours per day for a whole year would add an extra $255.50 to your electricity bill. Even if your don’t have a second home, something as simple as having a single light incorrectly turned on for six hours per day while you were at work would add almost $20 per year to your bill. The worst part of that is that it could run for years before you realize, possibly costing you hundreds of dollars. Okay, this one isn’t such a high tech solution. The best and most effective way of making sure your lights turn on and off when you want is by using a simple analogue light timer – available from DIY shops like Home Depot and larger supermarkets that have a “home” section. Mood lighting is all the rage these days – it immeasurably improves the “feel” of your home. For example, the ability to change from a cool light to a warm light when you finish working and settle down for the evening can help give the room a dual purpose, while effective use of color lights 7 Creative Uses for Colored LED Home Automation Lighting 7 Creative Uses for Colored LED Home Automation Lighting Turning on your lights automatically is certainly cool, but it doesn't take advantage of the full spectrum of colors available with RGB lighting. For that, we need to get creative. Read More can create the perfect ambiance for a sports game, a party, or a film. But what happens when mood lighting gets out of control? What happens when colors start changing when you don’t want them to? If it happens during the day you’ll probably get away with it. If it happens during the night, the consequences could be much more profound than simply spoiling your movie. It only takes a few teenagers to incorrectly interpret the flashing lights behind your drawn curtains as the party of the year for you to have a big problem on your hands. News spreads like wildfire on Facebook How Facebook Is Changing News Journalism for the Better How Facebook Is Changing News Journalism for the Better News outlets are considering publishing stories straight to Facebook. It's easy to be cynical. But this change could be a good thing – for readers and journalists. Read More , Snapchat, and Instagram, and before you know it you’ve got half of the neighborhood’s under 30s dancing on your Persian carpet. The police turn up to find underage drinkers passed out in your bathtub, your dog doing tequila shots with the hamster, and your garden shed on fire. Your insurance company will refuse to pay out – instead blaming you for gross incompetence, and you’ve now got a criminal record. It’s a disaster. 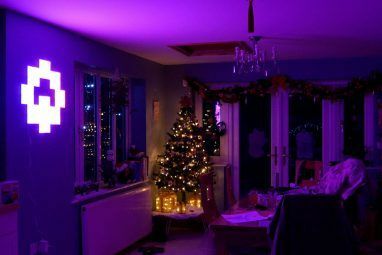 The market leader for mood lighting is Philips Hue system Light Your Home the Smart Way With Philips Hue Light Your Home the Smart Way With Philips Hue If you can afford the initial expenditure, you won't find a better-supported and more user-friendly smart lighting system on the market. Read More . 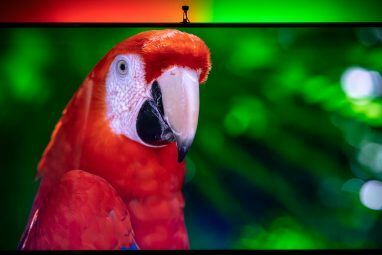 It makes use of Internet-connected lightbulbs that can be controlled from an app on your phone, and can supposedly support up to 16 million colors (if your eyesight is sharp enough to determine the difference between light green and ever-so-fractionally-lighter-green). You can add up to 50 bulbs to your system, and the whole thing links together using a Wi-Fi connected bridge. Once this bridge is connected to your wireless router you can control your lights from anywhere in the world. Unfortunately, the entry costs of the Philips Hue system are not cheap – the basic entry package (two lightbulbs and a bridge) will set you back $80 on Amazon. If you can’t afford to spend that much on the Philips offering, you can create a DIY lighting system in your home 9 Creative DIY Lighting Projects for the Home 9 Creative DIY Lighting Projects for the Home Read More , or you could follow James Bruce’s guide to controlling a lighting system with the iPhone Control Virtually Anything with Siri - No Jailbreak Required Control Virtually Anything with Siri - No Jailbreak Required Siri can be amazing at times, but she can only do what Apple allows her to do. Not anymore. Read More ‘s personal assistant Siri and an inexpensive Arduino. Have either you, your family, or your friends had any horror experiences with a smart lighting system? Perhaps you already have an effective smart lighting system in your home? Have you found it useful or are they a here-today-gone-tomorrow fad? Maybe you have a favorite or least favorite smart lighting system? As for the guy that is worried about fumbling with his cel phone to turn on the hallway light when he turns into the driveway - that is done with a simple motion sensor. Cel phone not required unless you want to turn it on from across town. Then you can set a delay to turn it back off after a a pre set time. Instead of a cel phone, I have a small controller beside the bed - press a button and the hallway light (not the bedroom light) comes on. Then as soon as I step through the bathroom door, the bathroom light turns on. If I leave the kitchen light on accidentally, I press the all lights off button from my bed - and every light in the house goes out. As for cost, about half of some of the newer heavier advertised systems. No, it is not perfect, like anything it has a few bugs. However, you do not need a engineering degree to install or use it. - it is simple. Interesting! I don't know many folks who run X-10 (around here anyway). I'm curious - do you regret having a wired system in place now that it's so easy to set up wireless systems these days? Or do you prefer wired? X-10 is not technically a wired system. It does use existing house wiring for most functions though. It is far simpler than what I have seen touted as internet connected remote control. Setting up a basic single light (or anything that can be controlled by a switch) is as simple as plugging in a receiver/transmitter into an outlet somewhere in the house, and plugging in a switch with a lamp plugged in where ever you want it. Then setting the switch, wireless transmitter and receiver to the code you want - a house code and unit code to match. Then use the wireless unit to turn the light on/off and dim/bright. One wireless transmitter can handle 16 separate receivers, and multiple receivers can be set to the same code to work together. There are 16 house codes that can each handle 16 outputs that can do anything that a manual switch can do. (256 total channels) Mine controls the hot water heater as well as nearly all of the lighting. There are several options for switches - Plug in switch modules, wired in that work exactly like a normal wall switch, screw in modules that go between a lamp and bulb, internal wired modules that work for things like ceiling fans and even burglar alarms and video cameras. It has several apps for cell phones - PC, Android, MAC and linux interfaces. and a lot of third party gadgets as well. I have seen one user that has voice control on his, but that is not something for a neophyte user. It works more like a wireless TV remote but you can have multiple remotes where you want them. There is even a universal TV remote that can work with X-10 as well as any TV. With the ability to do stuff like dim the lights when you turn on the TV. X-10 is a LOT more than just a system to turn lights on and off with a cell phone - although it can do that as well. 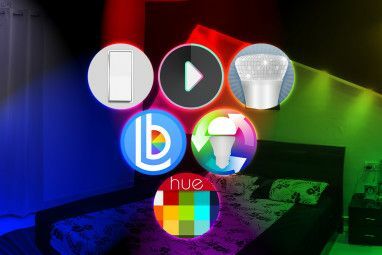 "the ability to turn on a light in your hallway when you pull into your driveway"
Isn't it quicker and simpler to just manually flick a switch than to fumble with your smartphone trying to find your "light-control" app among the hundreds of others installed apps? "a way to turn on a soft bathroom light from your bed when you need to stumble to the bathroom in the middle of the night." By the time you finish fumbling with the smartphone, it will be too late to stumble to the bathroom and/or you'll be fully awake, unable to go back to sleep. The cost is not as much as you think, unless you insist on lighting up your house like some Times Square theater. Our family of four lives in an all-electric house. My mother lives by herself in a similar sized house but uses oil, propane and electricity. Both houses are in the New York Metro area so we are paying the same energy rates. My energy bills are consistently lower than hers by a significant amount. FYI - Going on a Budget Plan with your energy provider(s) alleviates the shock of unexpected high bill. Maybe if you're Bill Nye or Ed Begley Jr. or Al & Tipper Gore, the costs of setting up a Smart Home seem inconsequential but when you're John Q. Public or Joe Sixpack those costs are prohibitive. Leaving the lights on can get pretty expensive, unless folks have completely migrated to the low-energy light bulbs I suppose. In my case, the kids leave the basement lights on all the time (laundry room is down there). That's 8 light bulbs burning up a fair wattage for hours. Having just a single smart light switch programmed with a motion detector ($40 to $50 each tops) would definitely save a lot of money. I'm not sure why people think Smart Home automation is expensive, it's not! I do not have a smart switch in the basement, just a regular run of the mill motion detector one would stick on the outside of a house. "I’m not sure why people think Smart Home automation is expensive, it’s not!" "Expensive" is a relative term. It all depends on how crazy you get with the gizmos.